Installation is really easy, you do NOT need to root your phone. Simply install TWRP recovery then install ROM/Gapps and reboot. Will work on any Galaxy S5 supported below. This is the Resurrection Remix ROM which comes with all the standard features of latest Android 8.1 Oreo along with slew of customization. For example, you will be able to customize your status bar(center clock) or even customize your hardware buttons(e.g. back button become camera button). Performance also much improved with Antutu scores nearing 70K so you will have lag-free performance. Now, this is NOT a TouchWiz-based ROM, meaning you will get nearly pure Google OS just like on Nexus devices but even better since you get the added customization from Resurrection Remix team. Also, camera works flawless and 4K video recording is supported. In my testing, I found everything working out of the box including WiFi, calls, 4G LTE, etc…etc… If you are still on laggy Samsung TouchWiz or older Android OS, this is definitely the best way to make your phone new and start over. Special Thanks to the Resurrection Remix Team, please hit Thanks here on XDA and donate! Q: Does this work on AT&T SM-G900A? A: Unfortunately no, the AT&T SM-G900A has a locked bootloader and no one has been able to figure out how to unlock the bootloader yet. Your best bet is to sell your AT&T SM-G900A and grab the T-Mobile SM-G900T instead which will allow you to fully root and also use fully on AT&T 4G LTE network. Q: Does this work on Verizon SM-G900V? A: Yes, but you need to unlock the bootloader first. Please see this post. Once bootloader has been unlocked, you can flash any S5 ROMs like a regular klte. Q: Will this allow me to enjoy latest Android 8.1 Oreo? A: Yes, you will be able to enjoy the latest Android Oreo along with slew of customization/features Resurrection Remix ROM brings. Performance will be enhanced and also your battery life will improve with latest Android Oreo custom ROM. Q: Does this ROM work on Korean SM-G900K, SM-G900S, or SM-G900L? Q: Why do I need to flash Gapps? A: You need to flash Android 8.0/8.1 Gapps since most custom ROMs do NOT come with Play Store. It is easy to do, simply flash Gapps after flashing ROM with TWRP recovery, that’s it! Q: Do I lose all my apps? A: If you are coming from stock firmware, yes. You will have to start over since custom ROMs like this are not usually compatible with stock firmware. However, you will be able to update to newer versions of this custom ROM without losing apps by simply flashing over ROM and Gapps without factory reset. Q: Do I need to root my Galaxy S5 to install this ROM? A: No, you only need to flash TWRP recovery to install this ROM. TWRP recovery allow you to flash any custom ROM and it is easy to install TWRP using ODIN as shown in the video above. Q: I am a beginner, can I do this without problems? A: Yes, anyone can indeed install this if you follow the video tutorial step-by-step. Please only install ROMs on a phone you don’t use or at least have a backup phone so if something goes wrong, you will have another phone to make/receive calls. Use your common sense and don’t install ROMs on a phone you absolutely need at the moment. Also give yourself plenty of time(few hours) to install a ROM so you don’t hurry and miss a step. Would this work on galaxy s4? Is there an option for S6? Does anyone know if this works on the S5 SM-G900A as well ??? Everything works great but mobile data is greyed out. Error states: (No SIM card – 123456) in upper left part of the screen. Any suggestions would be appreciated. Thanks in Advanced. I have the same problem, no network on my SM-G900F (dual SIM). Does your IR blaster work on your S5? Flashed this ROM today and noticed my AnyMote isn’t recognizing the ability. I have problems with autorotate. Is not going back to portrait. I need to lock and unlock the phone to come back to portrait. Hi Max, tried to install it with TWRP on a SM-G900M and got a message saying the ROM is not intended for this device. Any suggestions? Did you update your TWRP to latest? Updated TWRP, worked like a charm. You´re the best. Thankx Max!!! Hi Max, is there any custom rom for Samsung Galaxy s5 Neo SM-G903F? I succedd to install the version on my SM-G900F phone and almost evreything works fine except the camera. The pictures mode works fine but I am not able to take a video. I start the recording and when I press stop the application crash. same thing happens with me SM-G900P phone , video recording crases or says do not support video format, even other apps cant record but can take pictures can you help please MAX ? Please can this rom work on my s5 SM-G900H ???? Please reply before I start to download. The 4/5 release of RR Oreo v8.1 (RR-O-v6.0.0-20180405-klte-Official) is good but has several flaws that make it not ready for day-to-day use. 3. Battery drains dramatically fast compared to Samsung or LineageOS. A full battery lasts 12 hours on Samsung, 8 hours on LineageOS and 3 hours on RR. 4. No support for T-Mobile’s WiFi-Calling. Lineage OS also has no support for WiFi-Calling. I have a problem with camera because when I finish recording I can not find where is the move saved. I don’t have it in my gallery. has anyone posted a fix for this? or an explanation? I flashed Resurrection Remix Oreo released /klte/RR-O-v6.0.0-20180425-klte-Official.zip to my galaxy s5. I cannot get sidesync to work and there is no app file you can place on the home screen to contain other apps instead of just listing them on a page. Finally, what is the best way to update oreo, where do I go for future updates. Your help is appreciated. Correction, sidesync does work. You must change some app settings on sidesync to work. On marshamallo galaxy s5 you can install with no app setting change. In marshamallo you could create an app folder from the three dots where all the apps are listed. Then you can put all your communication apps in one folder, all your astro apps in another folder, all your photo apps , also in another folder, etc. Whereas in Oreo you have just one folder or page that list all your apps in alphabetical order. You need to remember the apps name to scroll the Oreo app page alphabetically. I have not found an application that can make an app folder described above. I like Oreo a lot, especially the missing memory hogging battery draining applications from other vendors and tmobile, lookout and Samsung apps that everyone hated, but could not delete because it might cause other system apps not to function properly. What a joy to be able to put Oreo on galaxy S5 that was headed for the bone yard and give economically deprived individuals a chance to pick up a great Samsung smartphone with a current operating system for under a hundred dollars.on ebay, instead of paying much higher prices. This is a major breakthrough. A font forget the Galaxy S5 has a micro SD slot allowing you to insert a 128 mb (or more) that can be partitioned to increase your internal memory far beyond 32 gb , and give many GB of external memory use such apps as app2sd program. Some one concepts mentioned above are going to revolutionize the smartphone industry. My sincire appreciation to all the Oreo team members that worked hard on this project. Also, a special thanks to Max. Correction on a orrection. You can create an app folder that can contain other apps on Oreo by simply placing one app directly over another app. I missed this feature because I did not see a direction to create a circular app folder. In marshamallo you have a direction to create an app folder when you press the three dots you will see create folder. Oreo allows you to name that new group of apps below the circular app folder. Also, I thought I solved the problem to get sidesync working on Oreo, but now back to the drawing board. On marshamallo I used sidesync on my phone to connect by USB to my Lenovo T520. I like using a USB connection for a more stable video than using WiFi with its static interference and sometimes shaky picture. I like sidesync, but looking for another alternative using USB. What about Galaxy s5 At&t version sm-g900a ? Just flashed my S5 and it works just fine for the most of the time, but the videocam is not working for me either, has someone got it to work? And how about new releases, how do i get hol of them? Can I do this to the SM G900H? If I have AT&T unlock my SM-G900A, will it then work? If you can unlock the bootloader yes. @lee… thanks, I own a Att phone and i have unlock code from ATT .. So i can use this update correct ? Yes of course. Sim unlock has not much to do with root. can i use this on the g900fd? will sm-g9006v work? pls reply …. I have tried and it went into a boot loop …. Everything works great on S5 SM900F.thanks. Finally got it downloaded and working like a charm…..much thanks!! 하이 맥스~ sm-g906l 버전은 안돼나요? Hi Max will this rom work for this model SM-G9001 and can you tell me if any bugs . Does everything work??? boot time still same? bluetooth ,rec video? any known compatibility issues with this model??? Most importantly please tell me Max after I install the rom and some things dont work can I do a factory reset and restore my previous O/S Android Marshmellow??? Jay – hi rob i got the same S5 model as you did you some issues with the rom? . If i cant restore my original O/S I wont install this Rom. I would like to know that too, could u let me know? Not this one, G900H is not the best model for custom ROMs unfortunately. Max, how safe is this for my phone? Thanks! That is great to know, but does it work with SM-G900MD model???? Great video, do you have any solutions for my phone not recognizing my sim card? It’s a sm-g900p. Can i install this on sm-g900t1? I’ve had my SM-G900F since mid-2014, when I bought it new. Started on KitKat and it has seen every major version of Android since. Now on Oreo, RR-O-v6.1.0.20180711. It is still going strong, and even though phones more superior (in some ways!) are being released, I’ve been happy holding on to my S5. It’s also nice to see how cheaply a second-hand S5 can be picked up for now, and that the latest OS and security patches are still available for it, through custom ROM’s. If there’s one gripe I have with the Resurrection Remix ROM, it’s that my bluetooth gamepads do not work. I have an 8bitdo NES30 Pro, as well as 2x 8bitdo Zero controllers. They pair just fine to the phone, but nothing happens when buttons are pressed. Bluetooth audio works fine, it’s just gamepad input. I moved to an RR Oreo ROM from a LOS Nougat one, and it worked fine with that. Is anyone else experiencing this issue, and know of a solution? If not, no worries. I just hope that the issue will be resolved in a future update. I am also having the same problem with using a Xbox One controller. It pairs just fine(actually better and faster than with the OEM Marshmallow) but inputs dont work. When playing Assoluto you have graphs for your throttle and brake inputs, occasionally and randomly the throttle will show full for a split second. Judging by that there is at least something being received. just a little update if found an app called Gamepad Tester on the play store. It does not show any inputs, but in the connected tab there is a line that says “cat: /proc/bus/input/devices: Permission denied” I am going to assume this is our problem. Now Im going to work on granting that permission. Hi Jeff, thanks for your reply. That is interesting! Please let me know the outcome, in granting that permission. For now, I’m getting by with hooking the gamepad up to the phone with its USB cable and an OTG cable. Hello, first thank you for the tutorial. I cannot seem to get past the recover.img in Odin3. Any suggestions? You need to post more info. Start with type of phone you have! And maybe someone with the same will help you. Hi Maxx I followed all steps to install Oreo but unfortunately, my phone reinitiates again and again and without no success. Hey I got as far as installing twrp. When it rebooted I tried volume up, power and centre button bt it just loaded normally. Poppwed battery out like you said in video and now my phone won’t turn back on. Looks completely stuff. Nothing works. Any ideas? i have a small problem / i ve got glaxy s 5 that shows it self up as 900t . i tried to flash youre rom but it says its not compatible . instead of that it just bring me back to factory settings . Any ideas why ? will this work on SM-G900H? this did not work for mine! now i lost my software and doesn’t load to my home page! Does this work on the boost Mobile s5? is this work in SM-G900H? is this work on SM-G900P without bugs? Because Im just only a beginner . Good morning to all the people of Thailand who taught me about spirituality and teamwork when I was an English teacher in Bangkok about twenty years ago. Good morning Max Lee. About a week ago I took my three mint condition galaxy S 5’s g900t ( AT&T) and completely wiped out my galaxy S5 and 32gb san disk cards using TWRP-I wiped everything out. Next, I used Odin3 to install Marshamallo for g900t baseband G900TUVS1GPG2 and TWRP 3.2.1.0 . Next, used TWRP to flash the Android OS 8.1.0 Android security patch of July 5 2018 using RR-OS version: RR-O-v6.1.0-20180730-kite-Official on top of the last Samsung firmware update for Marshamallo which is now the baseband version G900TUVS1GPG2. Also with TWRP flashed Magisk-v16.4 , do not use Magisk-v14.5 and A-GAPPS-arm64-8.0.01102017. Note:flashed the Magisk and A-GAPPS back to back, one right after the other without closing Odin3. This may help prevent Oreo 8.1.0 from crashing. After flashing, catch your breath, reboot using TWRP. Note: if you do not install programs back to back, you might get a TWRP bootloop. The way to get rid of this TWRP bootloop is simple: using TWRP, do a factory reset and reinstall TWRP again using Odin3, then use TWRP to reinstall A-GAPPS and Magisk. No more bootloop. 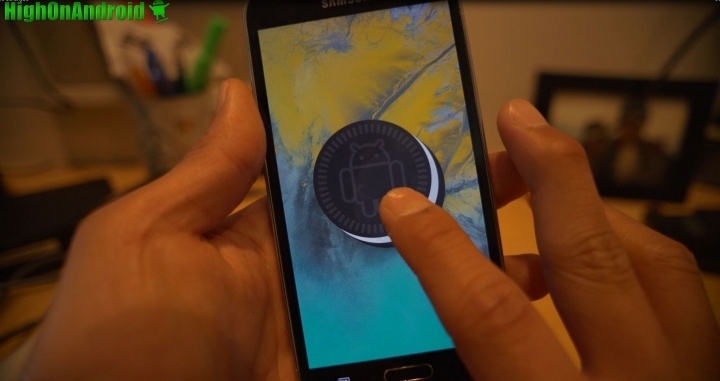 Once you have Oreo 8.1.0 installed on your Galaxy S5 g900t. platform msm8974, use APPS2SD program to partition your 32gb micro sd card, and comence, begin, transfering programs from internal memory to external memory sd card. Get a load of this: as I am using APPS2SD transfering programs on my Oreo 8.1.0 equiped Galaxy S5 g900t, up pops up a photograph of Max Lee and his family smiling at me, winin the APPS2SD program. Max Lee photograph only lasted on my screen about one two hundredths of a second. I am fast when it comes to subliminal transmissions. I smiled back, I kid you not. To the thai soccer team and the rescue heros that saved them, thank you for sharing your courage, spirituality and teamwork in the land of smiles known as Thailand. Lord God Buddah has arrived. Correction in paragraph 2, “without closing Odin3”, should read “without closing TWRP”. Correction 2 : In paragraph 2 , it should read: The way to get rid of this TWRP bootloop is simple, reinstall TWRP using Odin3. You will install TWRP over the previos install of TWRP. It does not have to be a different recovery program. Once TWRP is reinstalled then use that TWRP to reinstall the Magisk and A-GAPPS apps. Max, been trying to load the Oreo ROM on my note 5 but had some issues. Speficically I can’t configure the APN settings for my Cell Carrier (Tmobile). It won’t let me put in ANY of the information. What could be the issue? I followed the steps to a T as far as I know. What could I be missing? Hi max, series SM-G906S its work or not? Thanks for the awesome tutorial. It may be worth noting that if you have encrypted the s5 that you need to do a factory reset before you install the oreo rom. As I found out TWRP can’t mount /data, due to not knowing the encryption footer. I was able to do a wipe from TWRP but now can never go back to 6.0.1. I figured it out and got it to work. Thank You for the info.. I found out so far that I have 3 problems. The first is in messaging, the voice to speech does not work. The 2nd issue is that the video camera mode does not save the videos anywhere. The 3rd is that Vudu does not let me watch HDX movies anymore. Only SD version. Anyone else have these problems. Also does anyone have a stock T-Mobile SM-G900T backup. My backup did not work correctly. At times I want to revert to it. Any help would be appreciated. I have a rooted Galaxy S5 from T-Mobile (rooted using directions and helps from here–Thanks!). I first tried installing the April 5th Android 8.1 Oreo that I got from the link here. I also used TWRP to Flash the GAPPS 8.1 (also from the link above). The Oreo flashed fine, but I didn’t get the GAPPS installed (I tried twice). I then went ahead and flashed the Cyanogen Mod (cm-14.1-20161029-UNOFFICIAL-klte, the unofficial version from Resurrection Remix?) of Android 7.01. That worked fine as well and GAPPS showed up when I flashed (I have had other problems with that, but I’ll comment on them in that area, unless you want me to mention them here). When Im trying to install, “RR-O-v6.0.0-20180405-klte-Official.zip” saying corrupt. Any recommendations for stable Android 7- 8.1 roms for the S5 Neo (G903F)? This works like a charm on my S5, thanks for publishing. However, I cannot make the Google voice search widget listwn automatically on home screen. I do not have a google account. I tried various tutorials from forum searches. Is there anybody having a special hint? hi, tanx for all thr help. is there a way to go back to the stock firmware (6.0.1 t-mobile) so ss will be usefull again? Hello, can I install the ROM on a SM-G900H model? Hi Max, I have just installed the ROM on my S5, and everything was working fine, now half of the screen is Red on the top and black on the bottom. If I connect the pwer cable is turns yellow! does the modded pixel 2 camera works on this rom? Except for my bad timing the installation went fine. wifi worked, bluetooth worked, Ithought I was good until I tried to send a text and realized it couldn’t find my sim card. I reverted to my backup so luckily I can still make calls but still, hopes have been dashed. Will it work on SM-G900h? is there is an option for on5 pro? Would this work on the SM-G900FD? Do you think that I can use the above ROM for Galaxy Note 5 SM-N920P HW ver 1.06 rooted? Next story Orbit B-Hyve Review! – WiFi Sprinkler Controller! Previous story Which Model is Best for Galaxy S9/S9+ Root?